It was a bit ironic. Smartphones were used this week to snap pictures of a historic phone that was used to make the first coast-to-coast phone call 100 years ago. On Jan. 25, 1915, to celebrate the completion of the Panama Canal and to show that San Francisco had recovered from the 1906 earthquake and fire, American Telephone and Telegraph Co. conducted a call between the city and New York. It was made just before the opening of the Panama-Pacific International Exposition and World's Fair in San Francisco. 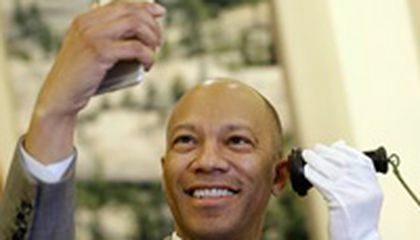 "Thinking about the ability to transmit the human voice over 3,400 miles was considered absolutely impossible," said current AT&T California President Ken McNeely. He snapped a selfie with the old black handheld. "Fast forward to today when we hold all knowledge of human kind in the palm of our hands with smartphones. We've come a long way." 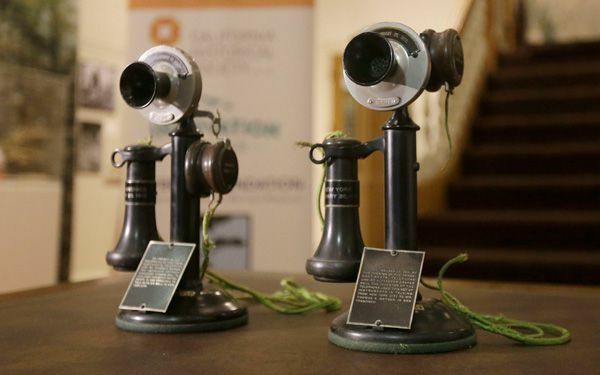 The original phones will be on display at the California Historical Society as part of its "City Rising: San Francisco and the 1915 World Fair" exhibition, which opens on Feb. 22. That first call was made by Alexander Graham Bell in New York and he called his assistant, Thomas Watson, who was attending the World's Fair in San Francisco. Bell had invented the phone a few decades earlier. Listening in were President Woodrow Wilson in Washington, and Theodore Vail, president of American Telephone and Telegraph Co. in Georgia. According to the transcript of that call, Bell's first words were "Ahoy! Ahoy! Mr. Watson, are you there? Do you hear me?" Watson replied, "Yes, Mr. Bell, I hear you perfectly." The call actually lasted about 3 1/2 hours. They kept the line open for a series of conversations and unlike today, there was no such thing as unlimited talk time for a set price. The cost of a three-minute, coast-to-coast call in 1915 was about $20, which is about $500 in current dollars. California Historical Society Executive Director Anthea Hartig said it took four years to create the infrastructure and more than 5 million pounds of material to build the coast-to-coast phone line. Actually, it represented almost 7,000 miles of telephone wire to connect these places. We think we're so modern. We participate in conference calls but they were doing that in 1915," she said. Hartig said Bell was a visionary and wanted to push technology as far as possible. "I think that he would be delighted and amazed to think that we have the world in our palms," she said. "I think he would be right there with us, texting and walking and hopefully not driving." Critical thinking challenge: Why did this first transcontinental call last for over three hours?